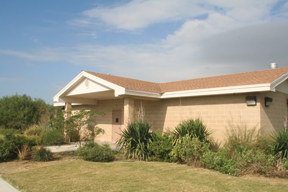 The mission of the Buddy Temple Wildlife Pathology & Diagnostic Laboratory is to advance the study of wildlife health. This facility allows Institute researchers to advance wildlife science by conducting studies that increase our understanding of body conditions, genetics, diseases, parasites, environmental contaminants, and natural toxins. Such research is necessary to provide the basis for effective management strategies. Many wildlife research questions can only be answered by sampling tissues, investigating body condition through nutrient reserves, determining important dietary components, assessing prevalence of parasites, or occurrence of diseases. There are numerous morbidity and mortality factors that regulate wildlife populations, but very little is known about the impacts of wildlife disease, parasites, and environmental contaminants. Additionally, transmittable diseases between wildlife and humans are becoming a major public health concern and require sound research to understand how they are introduced and the links between wildlife and humans. The Temple Wildlife Pathology & Diagnostic Laboratory was designed to permit animal tissue research in an off-campus facility, thereby allowing scientists to expand their research efforts in areas that were not possible using existing laboratory facilities on campus. The Temple Wildlife Pathology & Diagnostic Laboratory provides an environment for investigation of research that requires dissection or necropsies. The building includes two, self-contained laboratory rooms. One room is a Biosafety Level I lab, which provides space for investigations of animals and their tissues with no known biosafety hazards. The second room is limited-access laboratory that allows Biosafety Level II research, which permits investigation of parasites and diseases that can be harmful to humans. The design of the facility allows for ease in cleaning, sterilization, and operation. Separate access, air flow, septic systems, and freezer storage allows the two laboratory rooms to function without cross-contamination of potential biological hazards. Two large walk-in freezers provide abundant storage capability of tissue and other biological samples. Each laboratory has necropsy tables that allow animals as large as white-tailed deer to be examined. Research that uses data from other core Institute laboratories may be initiated in the Temple Wildlife Pathology & Diagnostic Laboratory. Research that extracts tissues, parasites, or food items from animals, or conducts necropsies to address parasite, contaminant, disease, or genetic research is conducted in this lab. The Institute has emerged as one of the leaders in identifying and responding to natural factors that harm wildlife in Texas. Past and current research has involved the effects of aflatoxin on birds and parasitic roundworms that infect the human brain. New discoveries about wildlife diseases, parasites, and toxins will help Institute researchers determine how to lessen their impact on wildlife populations. This in turn, will provide key information to local landowners and others working to sustain and enhance wildlife found on their property. Other studies to be conducted will focus on the effects of human-made pesticides and other environmental contaminants on behavior, reproduction, and survival of affected wildlife species. This information will continue to be essential to understanding complex environmental relationships. Dr. Alan Fedynich has been instrumental in addressing key questions dealing with parasitic infections on resident and migratory bird populations. Dr. Scott Henke has investigated the effects of several zoonotic pathogens that are prevalent in south Texas wildlife populations. Dr. Bart Ballard has investigated nutrient reserve dynamics, molt intensity, and diet composition in several species of waterfowl to better understand resource use and species ecology.